Mallorca born former champion Jorge Lorenzo has moved to Repsol Honda, where he will remain for at least the next two seasons, whilst his compatriot Dani Pedrosa has ended his 13-year stretch with the team. Twice-world title winner Lorenzo will now be colleagues with young prodigy Marc Márquez who, at 25 and in his sixth MotoGP season, has clinched the championship slot four times and is comfortably in the running to do so for a fifth season. 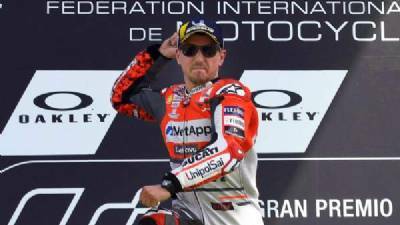 Lorenzo (first picture) will continue with team Ducati until the end of 2018, but had already signed the deal with Honda days before his win at the Italian Grand Prix in Mugello on Sunday. This was his first win with Ducati, and paddock speculation saw him returning to Yamaha, albeit on a non-factory bike and riding for a satellite team. Meanwhile, Dani Pedrosa and Honda made a ‘mutual decision’ to part company, and Lorenzo will inherit Pedrosa’s bike in 2019. Pedrosa started with Honda Racing (HRC) in 2006, and since then he has won 31 races and three reserve world championships with the Japanese giant. Pedrosa also thankd HRC for their ‘years of great successes’ during which he has ‘grown, not just as a race rider but also as a person’. “I’ll always carry HRC in my heart and in my head,” the Spaniard said.